What is a corporate terrarium workshop? How does a corporate terrarium workshop work? We host this bit of your team building, away day or client event. We start by giving them a little background into us and about the types of terrariums that you can make. Then we take a look at the plants available to play with and then we dive right in. Depending on the group size (we’ve done groups of 10 to 100) we run the workshop slightly differently, but can tutor the group in a way that works for the group size. Can you run a drop in terrarium workshop at our event? Yep! We can either run the workshop as a structured class setup, or we can make it a drop in terrarium workshop. Drop ins work well at casual events, or for events where people have limited time. How long does a corporate terrarium workshop last? It all depends on the size of the vessel. Our most common vessel size is just under 8 inches. This tends to take around 1.5 to 2 hours. If it’s a single plant drop in terrarium workshop, it can last around 15 minutes or so! We work with you find the right package to meet your event or workshop requirements. How much is a corporate or event terrarium workshop? It varies depending on the vessel size and also the number of attendees. Some clients like to offer up a budget per head in advance whereas others like us to come back with a couple of options. We’re happy to be briefed in whichever way works best for you. To give you an idea, our most common terrarium vessel (7inches) works out at £33 per head. 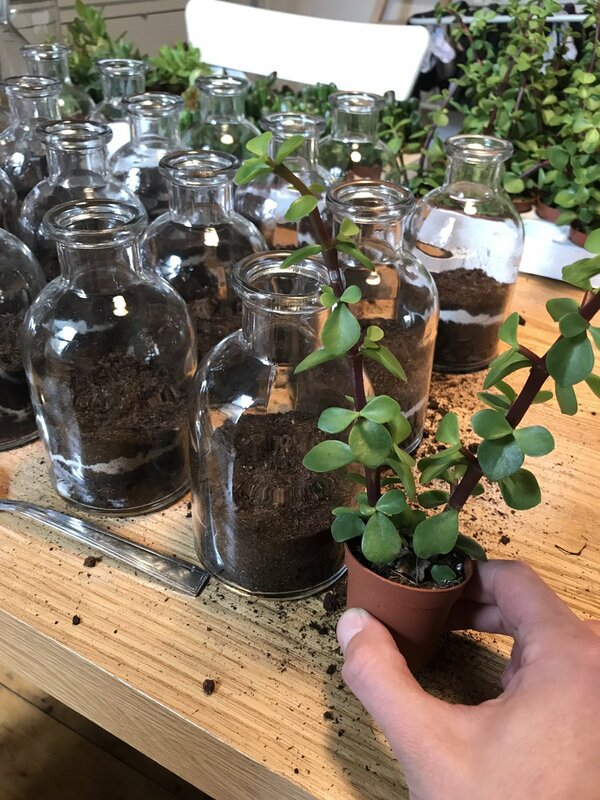 A single plant terrarium can be as low as £15, but again we can work with you on a brief if you’re looking for something to a specific budget. What setup do you need for a corporate terrarium workshop? The ideal setup is a seated horseshoe shape table layout, with a couple of tables at the size of the room for plants and decorative materials. We can work with mini groups on circular tables and if it’s a drop in we can work with a standing option only. What’s key is a surface for people to make their terrarium on. The terrarium workshops cannot work in a theatre style setup. How do I book a corporate terrarium workshop with you guys? The first step is fire us over a briefing email with rough dates, size of group and location. We can take it from there and start to build your package for you.